Studies have shown that very active children may have special dietary needs. Source Naturals Attentive Child™ is designed to support your child’s ability to focus—and kids love the sweet and tart taste! DMAE, a substance normally found in the brain, has been shown to help enhance mental concentration. Magnesium also plays a role in neuromuscular transmission and activity. L-Aspartate, an amino acid, acts as a neurotransmitter. Grape seed extract is rich in procyanidins, which have powerful antioxidant activity, and phosphatidylserine is a vital component of cell membranes, including those in the brain. RECOMMENDED USE: For ages 5-8, take 1 to 2 wafers, once daily. 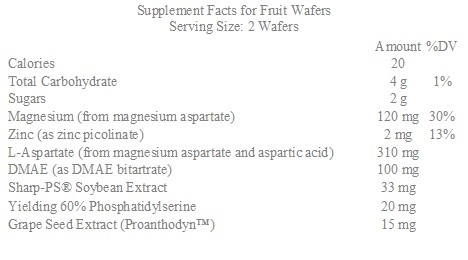 For ages 9 and up, take 1 to 2 wafers, once or twice daily. Chew wafers thoroughly. Suitable for vegetarians. Contains no yeast, dairy, egg, gluten, wheat, salt, preservatives, or artificial color, flavor or fragrance. Warning: Consult physician before using if you are pregnant, lactating, using blood thinners, anticipate surgery or are taking multiple medications. Other Ingredients: crystalline fructose, xylitol, stearic acid, magnesium stearate, silica, natural peach flavor, citric acid, and natural orange, chocolate and cherry flavors.